Arguably, the most popular designer on HGTV is Sarah Richardson. I just can't get enough of her work, and watching her interact with her sidekick Tommy is always a hoot. Way back, like over a year ago, I posted a scoop about a casting call for a new Sarah Richardson show. And as luck would have it, one of my readers (hi G!) read that post, applied, and actually got onto the show!! 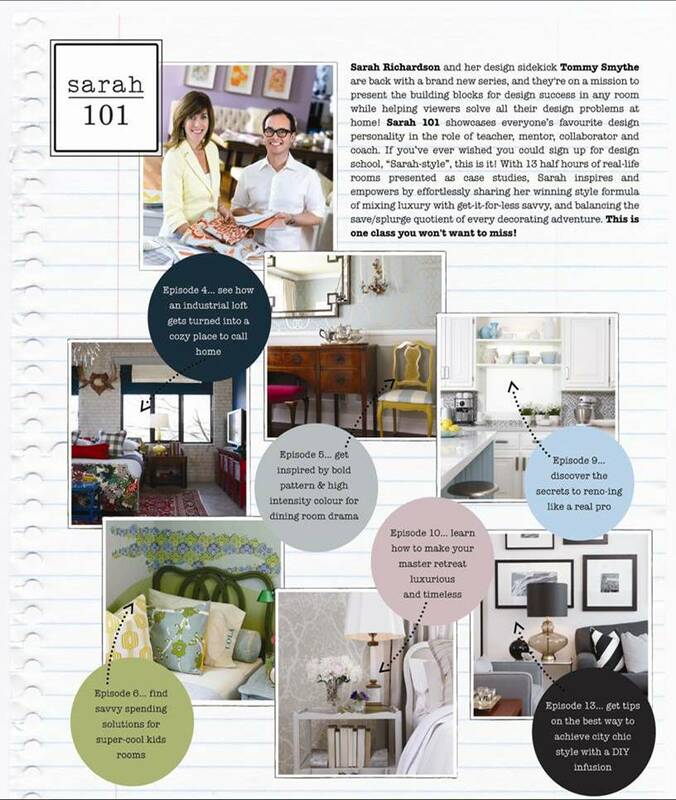 Lucky girl :) Soon, we'll all get to see how Sarah worked her magic on G's home because the new show, Sarah 101, launches on January 4th. I'm a huge fan of Sarah's. Her designs are timeless, liveable, and creative with a touch of the unexpected. With each series - Room Service, Design Inc., Sarah's House, Sarah's Cottage - she raises the design game and exposes us to something new and fresh. So I cannot wait for this new show... design lessons direct from Sarah and Tommy? Yes, please!! Hope you'll all tune in. The show launches Tuesday January 4th on HGTV Canada. And if that wasn't enough to look forward to... guess who will be getting some face time, one-on-one, live and in person with Sarah and Tommy? ME! You read that right. I get to meet and talk (or is it stammer and stutter?) with my design idols. I only hope it goes better than the first and only other time I've met Sarah. *that is, if I don't pass out from anxiety and nervousness first. Lucky you ..... I love Sarah's style also... classic but very up to date. Congrats! That is such great news! You will do great!!! Wow! That is so awesome! Ask Sarah where she shops... I love her style! Oh wow I am so extremely jealous!!! She is my design idol too. Every time I make a design decision I ask myself.... what would Sarah do?? Oh to ask her one question is so hard... I have a million and they all include her standing in my house ready to help. How fabulously exciting!!! I would ask Sarah for her insider scoop on where to get furniture reupholseterd/painted/built or her favourite insider fabric/wallpaper haunts. Such a fun opportunity- congrats! Here in the U.S., we're about three shows behind you (lucky) Canadians... still, I would DIE to meet with, talk with, simply stare at Sarah Richardson. Sigh. Questions I might want answers to: What inspires her designs, her palette choices, her pattern choices? Which designers/artists have most influenced her style? Where on earth does she get that one button jacket that I've seen her wear in many different fabrics (you know the one with the leather patches on the elbows)? What style or idea does she find herself gravitating toward time and time again? How does she know when enough is enough in design (i.e., how does she edit her own ideas)? I could go on, and on... I am so happy for you to get to talk with her. And jealous, but mostly happy. our pic of the dining room is in that collage! it's the top one with the green chair and pink bench! I'm so glad you'll get to meet her...I never did even after being on the show, but she was very very nice over email. Here in the U.S., we've just recently been introduced to Sarah on HGTV but like you, I too have fallen in love with her style. And her personality! She seems like such a nice down-to-earth person and I would imagine your conversation with her to be the same. Enjoy it! You'll have a blast, I'm sure. Go you! I love Sarah and Tommy. But how is it that you get to meet her and have one-on-one time? How come I don't watch this show? I need to start DVR-ing right now! Hey there! So great chatting with you this morning. I'm excited to meet them too! that's awesome! i love sarah! and tommy too! Lucky you!! Good luck with meeting them you'll be great!! Can't wait for the new show!! I'll be watching that one.. I would love to know how Sarah "reads" her clients. She always seems to hit the nail on the head, and I would love to know what questions she asks to determine her design direction. I don't have any help to offer since I don't follow Sarah, but I just wanted to pop my head in and congratulate you on your opportunity! You sound very excited - and you should be! Yay for new experiences. I too enjoy all the Sarah and Tommy interaction I can get! We have just bought an old house that, though in reasonable shape, will need extensive renovations in the next few years. Thus, I would like to ask Sarah and Tommy how the plan for a house renovation evolves. When working with an architect, contractor, and possibly a designer, in what order should these professionals be consulted and can a home owner act as their own designer and expect to achieve great results? cannot wait for the new show! go you for getting an interview ;) I'd ask sarah and Tommy to divulge their worst design blunder to date! Meanwhile, on a more *Shameless* Note on My part.. ;-) could you pass along [but ONLY if you feel comfortable about it] my Blog-dress [the stuff that was on my Card] to Them and the OFFER of "If They Should EVER Need a CUSTOM Blanket or Throw...?"! Otherwise, just say "Hi" for me! Sarah and Tommy seem to have a lot of fun which makes us all enjoy watching! So exciting! I would ask her to spend a day with me going to all of her favorite spots, asking what secrets she can share! Come by and enter my Giveaway from Fifi Flowers! do you hear that?...its me jumping up and down and clapping...so happy for you and this opportunity! I would love to know if Sarah and/or Tommy would EVER buy a new builder home...or would she always buy old in an established neighbourhood and reno, reno, reno! It's so exciting that a bunch if us bloggers get to go eh?! Sarah's work is gorgeous. Can't wait to see everyone's posts when they get to interview her! 1. I toured Sarah's House 2 when it was up for sale and always wondered why they didn't line the drapes. Is this a design preference? 2. How on earth does she get a do over on so many projects that go wrong? (Besides being SR!) When reno problems occur, the contractors always assume the client needs to live with it in my experience. Sarah always seems to get it re-done when it is not up to standard. Remember that all white kitchen and the gap in the counter? How about the bathroom tile in SH2 I believe? 3. If she was going to buy one piece of art today, what would it be? 4. How does she prevent the pre-finished Ikea cupboards from chipping easily after they are sprayed? 5. How does she go about making a floor plan for furniture? It always turns out so perfect and functional. Thanks for the chance to ask questions! oh wow, that IS exciting. While you are chatting with her...(so cool!) can you ask where she goes to get all of her stuff sprayed? And also where she shops for all her architectural remnant finds! Have a BLAST.